Orthodox Objectivism may have been doomed from the start, simply because it was a dogmatic philosophy that prided itself on rationality and self-interest yet which, in its specific doctrines and in the behavior of its adherents, often betrayed these stated objectives. Rand's contention that human beings are born "blank slates" is about as rational as the belief that the earth is flat. 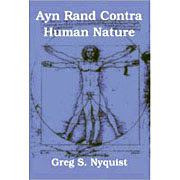 And as for self-interest: is it really in anyone's self-interest to embrace orthodox Objectivism? Doubts persist on this score. Some years ago Barbara Branden noted that far too many Objectivists came off as bitter and angry. Is it really in your self-interest to be angry all the time? Is it really in your self-interest to continually distort and/or misunderstand the views of people you disagree with, while at the same time being hyper-sensitive to alleged distortions of your own views? Is it really in your self-interest to remain an adherent of a philosophy which has no viable track record of making its adherents smarter, wiser, happier, or more fulfilled? Orthodox Objectivism had so much going against it right from the start. But the dim prospects of the philosophy were made many times worse by Rand's choice for the heir to her literary estate, namely, Dr. Leonard Peikoff.